Centered at the crossroads of culture, cuisine and crocodiles, Darwin has staked its claim on Australia’s tourist circuit in a big way. Located at the tip of the Northern Territory, along the Timor Sea in a region commonly referred to as the ‘Top End’, Darwin is Australia’s northernmost city and only tropical capital. Steeped in ancient Aboriginal culture, wartime history, untouched national parks and once-in-a-lifetime tourist destinations, this major Australian metropolis belongs on everyone's Bucket List. Here are the top 13 things to do during any trip to Darwin. Tour Darwin and learn about its history atop the city’s hop-on, hop-off, open-top, double-decker bus, The Darwin Explorer. Two tour routes run daily, Red and Blue, with multiple hop-on, hop-off stops throughout the tour. The morning tour, known as the Red Route, offers a sixty-minute tour of the city, including eleven stops and offering easy access to top tourist destinations. The afternoon tour, or the Blue Route, adds a stop at the East Point Military Museum extending the tour to a ninety-minute round trip, complete with stunning views of the Timor Sea. Purchase a one- or two-day pass to see the city and beyond, visit tourist attractions, and rest your weary legs in between adventures. Located in the heart of Darwin’s city center, Crocosaurus Cove houses the world’s largest display of Australian reptiles. Here you’ll learn about Australia’s exotic and deadly cold-blooded creatures, some of which you can even hold, feed and pet. Then, head out back to the famous Cage of Death, where guests are are enclosed in an acrylic box and first dangled over a crocodile tank while the crocs jump and snap below. As if that’s not enough, the cage is lowered into the tank below, eventually becoming fully submerged in water, where you’ll be eye-to-eye with a sixteen-foot croc. If you want a less intense interactions with the reptiles, take a short drive to Darwin’s premier tourist attraction, Crocodylus Park. A crocodile sanctuary at the core, you'll see more than a thousand freshwater and saltwater crocodiles of all ages and sizes swimming through canals, sunning on the banks and chomping down at feeding time. The park also houses meerkats, lions, tigers, monkeys, tortoises, chameleons, lizards, snakes and dingoes. Need more crocodiles in your life? Book a crocodile tour! Try the Adelaide River Jumping Crocodile cruise, recently voted one of the best wildlife cruises in Australia. With the waters surrounding Darwin riddled with deadly box jellyfish and saltwater crocodiles, it’s best to explore the coastline from the safety of a boat’s bow. Darwin day-trip cruises are a great way experience the majestic Australian coastline and its inhabitants, including the tropical birds that streak the sky in vibrant colors as they fly by. Check out Darwin Harbour Cruises, a family owned and operated cruise line offering dynamic daytime sightseeing tours, private events or stunning once-in-a-lifetime sunset champagne and dinner cruises aboard the famous steel-hulled, tri-level catamaran, The Charles Darwin. Due again to the very real dangers found in the waters off Darwin, including crocs, jellyfish, dangerous currents, riptides and unforgiving rocks covered in oysters, the city offers three waterparks for locals and tourists to cool their heels. At this free family fun park, swim, cycle, run through the waterpark or slide down one of three gigantic water slides. There’s also a basketball court, Skate Park, BBQ and picnic areas and an all-abilities playground. This water wonderland houses a six-lane Racer water slide that is insane. Owned and operated by the YMCA, the waterpark caters to families with small children. Splash around in a toddler play area, sit in shallow wading pools, take cover from the hot sun in shaded picnic areas and watch little’s run through water curtains. This is one destination you’ll really have to see to believe! To get to the Big Buoy waterpark, you’ll need to swim out to it and then climb up a rope. Floating in the center of the Darwin waterfront lagoon, you’ll find a massive inflatable playground and obstacle course where the dreams of watersports enthusiasts and thrill seekers come true. Climb to the top of the tower and plunge into the water below, slide down the slide, or get shot high into the air by your mates on the human launcher. Passes are sold in one-hour increments starting at $16.50 AUD. On February 19, 1942, nearly two hundred Japanese bomber planes—launched from the same four aircraft carriers responsible for the attack on Pearl Harbor two months prior—dropped more than 300 bombs on Darwin Harbour. Even with its sizable military base, Australia was not prepared for their first enemy attack. Darwin was decimated. Learn all about that day and Australia’s World War II history at the Darwin Military Museum’s Defence of Darwin Experience. Filled with interactive exhibits, stunning WWII artifacts, and looping wartime footage, including interviews with veterans, this is a must see for military buffs. The bombings didn’t stop that fateful day in February 1942. Sixty-four more air raids were carried out over the following 16 months. During that time, Australia and its allies worked to rebuild. To see the wartime scars, military museums and structures built to defend against the enemy, book one of three Military History Segway Tours, coordinated by a military historian. Stop at the Aviation Heritage Center to see a B-52 bomber (one of only two on display outside the US), other military aircraft, and the wreckage of a Japanese Zero fighter shot down during the first air raid. Australia’s indigenous people have been keepers of the land for tens of thousands of years. Book a tour of Darwin with an indigenous guide to learn about the Larrakia people, the Dreamtime story of the frog, and how sacred sites and wildlife in and around Darwin played a significant role in Aboriginal culture. If you have the time, take the short flight to Kakadu National Park (one of 60 national parks in the Northern Territory) to connect with the oldest living culture on earth and experience Aboriginal rock art dating back over twenty-five thousand years. Spend a day or two hiking the waterfall trails, swim in boulder creek and take an indigenous-owned cruise through the world-famous Yellow Water Billabong. If the short flight to Kakadu National Park is out of the question, no worries, you can still explore the majestic Australian Outback in one of the 20 national parks surrounding Darwin. Lace up the hiking boots or slip on your favorite pair of thongs (Aussie speak for flip-flops), and book a day tour to a National Park. 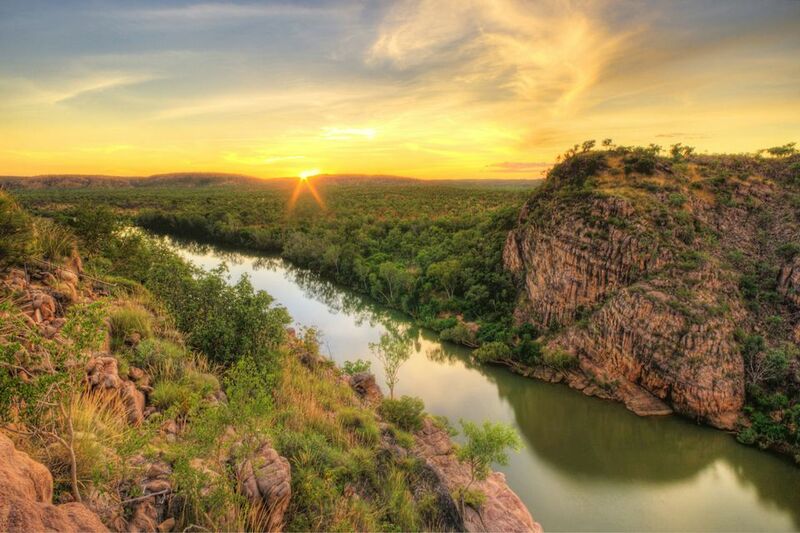 Litchfield National Park, located an hour and a half southeast of Darwin, is a favorite amongst locals. Get lost in majestic waterfalls, go bushwalking to scenic lookouts, and experience the reddest dirt you’ve ever seen in your life. Then, cool off in one of the swimming holes and watch the wildlife only found in Australia’s outback. Every Saturday from 8 a.m.-2 p.m., rain or shine, locals hit the Parap Village Market to have breakfast, listen to live music and purchase fresh locally grown fruits, veggies, dairy and meats from market vendors. Local vendors sell handmade crafts, clothing, jewelry and Aboriginal art, and anything else you can imagine. And don’t miss the 50 shops located in the Parap Shopping Village, including boutiques, beauty salons, cuisines from around the world, homewares, art galleries and more. Make sure you show up early and stay late to take advantage of the fusion of flavors, art, clothes, jewelry and live music you’ll only experience in Darwin. The George Brown Darwin Botanic Gardens span over more than 100 acres. This is one of only a few gardens in the world where both marine and estuarine plants grow naturally. And it amazingly survived both World War II and Cyclone Tracy, which reduced Darwin to rubble on Christmas morning 1974! Look for tropical orchids, bromeliads and exotic plants with scents that will take your breath away. Darwin’s Waterfront Precinct offers year-round events, free family recreation areas, a wave pool, world-class shops and, of course, the historic Stokes Hill Wharf, where you can eat alfresco while marveling at the stunning ocean views and world famous sunsets. Take the Heritage Trail to experience the full history of Darwin, including sacred sites of the Larrakia people, Darwin’s maritime history, and even see where the first bomb fell in the 1942 air raid. No trip to Darwin would be complete without a trip to the Mindil Sunset Market, held every Thursday and Sunday from 4 p.m.-9 p.m. Supporting over 300 small businesses and employing over 1000 locals, the Mindil Market is a Darwin institution, packed with cultural arts and crafts, soaps, perfumes, clothing, jewelry and everything in between. The vast selection of food and handmade goods is a testament to the fifty different nationalities that call Darwin home. After shopping, grab dinner from one of the vendors, then join the locals on Mindil beach to take in the world famous Darwin Sunset. Rest your weary legs at the world-renowned Deckchair Cinema. Located off the Darwin Harbour and operated by the Darwin Film Society, the outdoor cinema treats movie-goers to a range of classic movies, family favorites and Australian made and foreign films that don’t normally make it to mainstream cinemas, but should. Show up early and grab dinner and a drink before snuggling up to your special someone in one of the 250 deckchairs, or 150 straight back chairs, to watch the gorgeous sunset followed by a movie under the stars. Movies are shown seven nights a week through the dry season. Darwin is known the world over for displaying one of the best sunsets in the world—the deep reds, oranges, yellows and purples that streak the sky as the sun melts into the ocean will take your breath away. Wherever you are, whatever you do, make time for the sunset every night. Chances are, you’ll never see one like it again. What Is Autumn Like in Australia?